Recycling is one of the easiest, lowest-effort ways to reduce our environmental impact on a daily basis. 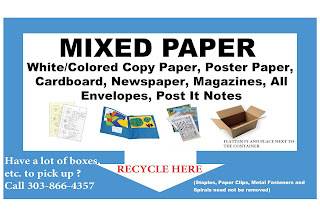 But what you can recycle and where to put it can be confusing, because what you do at home or what you did at a previous office may not be the same as what we can do here at CDPS. Can ONLY be used for paper. Do NOT get emptied by facilities staff. Must be emptied by individual employees into the bigger paper recycling receptacles in communal copy areas. Colorful signs posted on the receptacles let you know what goes where. Empty your individual workstation boxes/bins into these communal recycling bins for custodial staff to pick up. Plastic bags - CAN'T BE RECYCLED at work...but can be dropped off for recycling at most grocery stores. Aluminum foil- MUST BE CLEAN TO RECYCLE - zero food residue or oils. Cardboard pizza boxes - THROW AWAY unless completely clean of oils, food, etc. Kipling Complex buildings are managed by DPA's Capitol Complex Facilities. The CDPS Green Team met with representatives of DPA and Republic Services (their recycling vendor) in September 2016 to discuss the recycling program at Kipling complex and best management practices to help us be more sustainable in our operations. As a result of this meeting, the Kipling Complex Recycling Program was revamped and the CDPS Green Team developed visual materials to help employees understand what can be recycled and where. 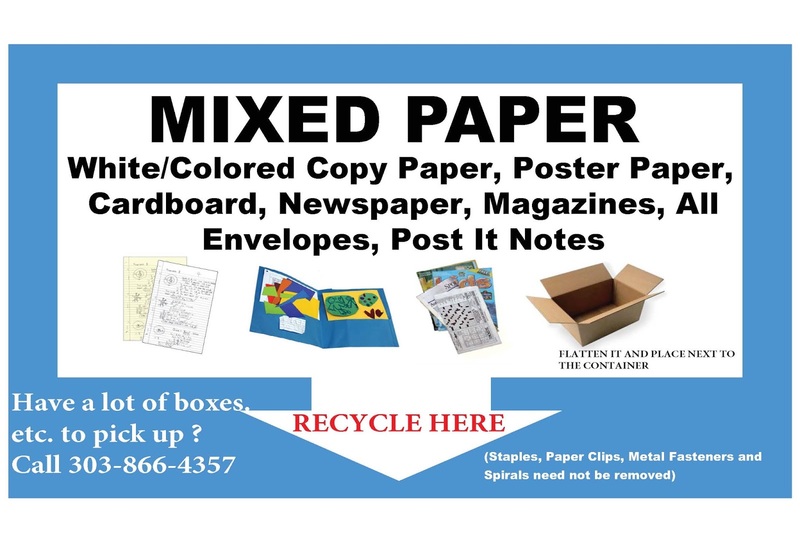 Any CDPS facility is welcome to use and customize these materials as well as contact CDPS Green Team for technical assistance with recycling program at their locations. For more information on how to be more sustainable and reduce your environmental impact at work, visit the CDPS Green Team web page.